But the underpinnings are completely new. Following , Subaru has unveiled the new fifth-generation 2019 Forester at the New York Auto Show. The automaker touts the new model as the most spacious and capable Forester yet. Like the Impreza, it rides on the new Subaru Global Platform bringing improved comfort and rigidity, but otherwise it looks quite similar to its predecessor. The new Toyota RAV4, on the other hand, is a radical departure from the previous model, sporting an SUV-like appearance. 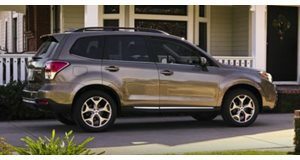 Then again, the Forester is one of the automaker’s most popular models, so it isn’t surprising to see Subaru playing it safe. Arriving in US dealers later this year, five trim levels will be available: standard, Premium, Limited, Touring and a new Sport trim, each powered by an updated 2.5-liter boxer engine with Auto Stop/Start producing 182 hp and 176 lb-ft of torque, up from 170 hp and 174 lb-ft, paired with a standard Lineartronic CVT. It also has 8.7 inches of ground clearance, which makes the new Forester more capable off-road than its competitors, according to the automaker. Subaru’s renowned Symmetrical all-wheel drive system comes standard, as does the advanced EyeSight Driver Assist. Subaru’s DriverFocus safety technology also debuts in the flagship Touring model, which can alert the driver of fatigue or distraction and automatically adjust driver settings such as seat position, climate, multifunction display during start-up. The system works using facial recognition and can recognize up to five drivers. It may look very familiar, but the new Forester has received some subtle styling tweaks as part of Subaru’s new design language to help it blend with the rest of the company’s lineup. Prominent whele arches emphasize the Symmetrical All-Wheel Drive system, front, side and rear underguards are standard on all models, and there are also new LED headlights as standard on all models. New colors are available including Jasper Green Metallic, Horizon Blue Pearl and Crimson Red Pearl, along with high-gloss black or silver trim. In terms of proportions, the wheelbase has increased from 103.9 inches to 105.1 inches, resulting in more rear seat legroom, which has increased by 1.4 inches at 39.4 inches, headroom, hip and shoulder room in the spacious cabin. Cargo space has also increased to 76.1 cu. ft. with the 60:40 split rear seatbacks lowered, a gain of 1.4 cu. ft. The load floor sits flatter, and the cargo area’s squared-off shape has been further optimized for ease of carrying large objects. The rear gate opening maximum width is now 51.2-inches wide, a 5.3-inch increase over the previous model and up to 8-inches wider than rival SUVs, according to Subaru. Subaru says you’ll now be able to load a full-size golf bag sideways without tilting it. Limited and Touring trim levels get a power rear gate as standard, but it’s also available as an option for Premium and Sport. Aimed at outdoor enthusiasts, the Sport model joins the line-up with unique appearance elements to help it stand out, including a grille with black gloss finish frame, 18-inch wheels finished in black, a rear roof spoiler and orange accents on the black underguards and roof rail mounts. The interior features a unique dark gray material with orange stitching and accents throughout exclusive to the Sport model. There’s also a version of Subaru Intelligent Drive with Intelligent and Sport Sharp modes and the Lineartronic CVT features a seven-speed manual mode. As standard, the Sport model also features a multi-function display, LED fog lights, High Beam Assist, exterior mirrors with integrated turn signals, Keyless Access with Push-Button Start and PIN Code Access and the All-Weather Package with heated front seats, heated exterior mirrors, and windshield wiper de-icer. As part of Subaru’s EyeSight Driver Assist Technology, standard safety tech includes Automatic Pre-Collision Braking, Adaptive Cruise Control, Lane Departure and Sway Warning, Lane Keep Assist, Pre-Collision Throttle Management and Lead Vehicle Start Alert. Other available assists include Reverse Automatic Braking and Blind Spot Detection with Lane Change Assist and Rear Cross Traffic Alert. Мы предлагаем заказать и аккумуляторы автомобильные киев у нашего менеджера.